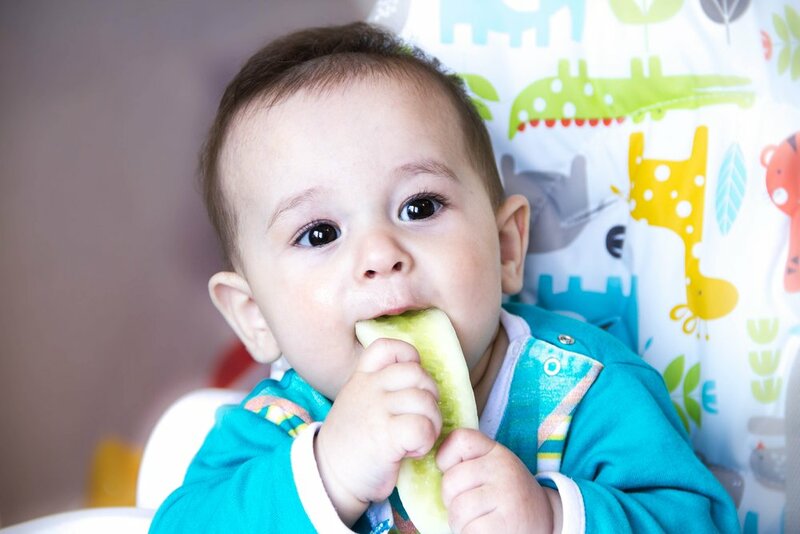 Baby-led weaning (BLW) is becoming a very popular way to feed solids to babies. It offers an alternative method to the traditional introduction to complementary foods in a baby’s diet. With this method, infants use their hands to explore food and to feed themselves, instead of being spoon-fed purees or baby food. If you and your pediatrician decide this is the method you’d like to try, your baby can begin once he is six months old, sits upright, and can bring objects to his mouth. Once your baby is ready, place graspable stick-shaped family foods (foods you eat at home without added salt or sugar) in the tray of his high chair, and let him pick it up and put it in his mouth freely. As a parent, you decide what to offer to your baby, but he will decide what to eat (which should also be true for traditional spoon feeding). Always remember that food should not be forced and milk remains an essential part of your baby’s diet. In theory, with BLW you expose your baby to a wide variety of healthy foods, teach him to eat food that the family enjoys, and allow him to control his own intake. No grams or teaspoons are counted when preparing your baby’s food, nor is it necessary for your baby to finish it all. Eating should be a pleasurable experience. What are some principles of BLW? Food offered must be soft enough to mash by pressing the tongue against the roof of mouth, and large enough so that small pieces do not break apart and become a choking hazard. The baby must have adult supervision while eating. The baby must be sitting upright when eating. The food must be the size of child’s fist and preferably protrude from fist when grasped. Baby should never be left alone with the food. Only your baby should put food in his mouth and at his own pace. Steamed broccoli florets, large enough to hold with the entire fist and soft enough to eat. Quarter piece of avocado with skin left on half the slice so your baby can hold it (same goes for bananas). Slow cooked large strips of meat or chicken (large enough so that when held the pieces protrude from the fist). Will my baby choke with this method? Many pediatricians and parents asked themselves the same question. Scientists conducted research on this topic and found that, if the above principles are taken into account, the risk of choking does not increase when compared to the risk of the traditional spoon-feeding method. Before starting with the BLW method, make sure to talk to your pediatrician, get all the proper information, and maybe even watch some videos to learn how to apply this method. Also, remember you can combine both traditional and BLW method to best fit your and your baby’s needs and routine.